Oil from a massive slick in the Gulf of Mexico has started washing ashore on an island chain off the coast of Louisiana, US officials have confirmed. Pelicans and other birds covered in oil have been found on the uninhabited Chandeleur islands, which are part of the Breton National Wildlife Refuge. A federal maritime agency said there was "oiling all over" the islands. Earlier, workers began lowering a giant funnel over the leaking oil well at the bottom of the sea to harvest the spill. Remote-controlled submarines are being used to lower the 90-tonne containment device in an operation expected to take two days. Oil has been leaking unstopped for 18 days from the well, 50 miles (80km) off Louisiana, since an explosion destroyed the Deepwater Horizon rig, operated by Transocean and leased by BP, last month. On Thursday, the US Coast Guard confirmed for the first time oil had made its way past protective booms and was washing up on land. Freemason Island, the southernmost of the "back islands" of the Chandeleur chain, was the first to be hit by a sheen of oil, although there was no evidence yet of medium or heavy crude. Heavier concentrations of crude remain further offshore, and the Coast Guard said weather forecasts suggested it would stay there until the weekend. A spokesman for BP said emergency teams had been sent to Freemason Island, a favourite fishing spot for recreational anglers some 30 miles (50km) off Louisiana's coast, to deploy inflatable booms to protect its prime marshland. The Associated Press also reported that a pinkish oily substance was washing up to the north on New Harbor Island, on which mangroves serve as roosting habitat for thousands of frigatebirds. Later, an official from the National Oceanic and Atmospheric Administration said oil was coming ashore all across the Chandeleur Islands. They are the second oldest national wildlife refuge in the US and home to countless endangered birds. 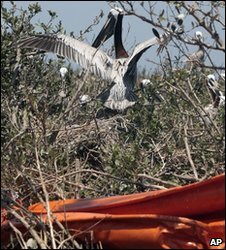 Jeff Dauzat, of the Louisiana Department of Environmental Quality, meanwhile reported that oiled birds, including gannets and brown pelicans, had been found on the barrier chain. 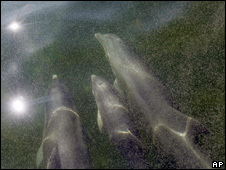 No other species have been affected. Fears are also growing that sea life has already been severely affected in the area, which includes vital spawning grounds for fish, shrimp and crabs. "It's all over the place," Dustin Chauvin, a shrimp-boat captain from Terrebonne Parish, told AP. "That's our whole fishing ground. That's our livelihood." 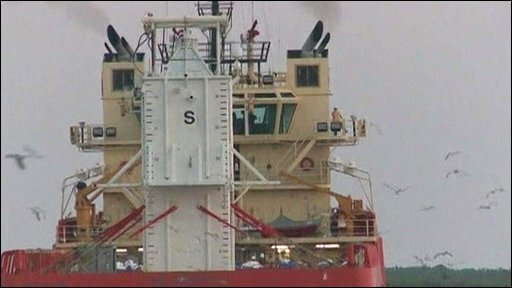 Workers on board a ship have meanwhile begun lowering a concrete and steel containment device to the sea floor some 5,000ft below (1.5km) below in a bid to capture as much as 85% of the oil gushing from the damaged wellhead. 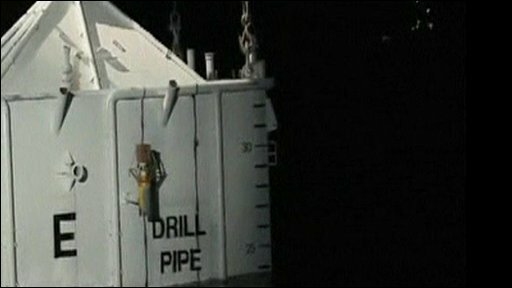 BP said the operation to fix the 40ft (12m) funnel in place with submersibles was expected to take two days, and a further two days would be required to connect it to a ship above via a drill-pipe. The technology has been used a few times in shallow waters, but never at such extreme depths and under such high pressure. There is also a chance that the device could damage the well and make the leak worse. Other risks include the drill-pipe becoming clogged with ice, and explosions when separating the mix of oil, gas and water on the surface. BP Chief Executive Tony Hayward denied his company had been slow to react, saying the firm had mobilised immediately to contain the threat. "It's a military operation and we are thinking of it as a battle on three fronts: beneath the sea, in the sea, and on the shore," he added. Mr Hayward said 100 ships were involved in an operation to skim oil from the sea's surface - including 20 of the world's largest skimming vessels. Thousands of feet of boom were being used as a barrier to contain the slick and a small air force was deploying dispersants, he added. Earlier, BP said it had sealed the smallest of the three leaks spilling oil. Favourable weather conditions also allowed crews to burn off more of the oil where it is most heavily concentrated.